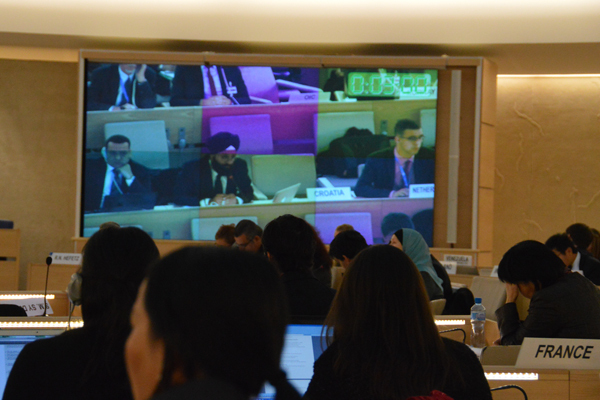 Geneva, December 9, 2013 – ICAAD Advisor, Ranjit G. Singh, presented in Geneva on Nov. 27th at the Forum on Minority Issues “Beyond freedom of religion or belief: guaranteeing the rights of religious minorities,” held by the UN Office of the High Commissioner on Human Rights (OHCHR). Ranjit focused his discussion on the impact of state regulations on religion, like the ban on religious manifestation in France, which undermines the dignity and identity of Sikhs, Muslims and Jews.In his testimony Ranjit stated, “In principle, Laicité must allow the right to worship one’s faith freely in society, otherwise, the separation between religion and state becomes blurred and the state becomes irreparably entangled in religious practice. Laws that exclude manifesting one’s belief in public schools (law of 15 March 2004), on ID cards (Home Ministry Regulation on ID card pictures of 2005) and in public (2011 ban on the Islamic veil) undermine Laicité.”Read Ranjit Singh’s entire testimony here, in French or English (translated). ICAAD will be submitting a Shadow Report to the UN Human Rights Committee (HRC) on the effect of the ban on religious manifestation on minority communities in France. The report will include direct testimony from French youths who were barred from public education because of the discriminatory law, and provide recommendations on how France can comply with its international human rights obligations. ICAAD’s Senior Advisor Tejinder Singh of Goldstein Russell, P.C. is preparing the submission before the HRC. ICAAD is also working with a French pro bono law firm to explore and develop litigation and advocacy strategies to challenge laws banning religious manifestation in France. Read our Previous Universal Periodic Review (UPR) Report on France. How can we hold torturers accountable if we are unwilling to uphold our own laws?